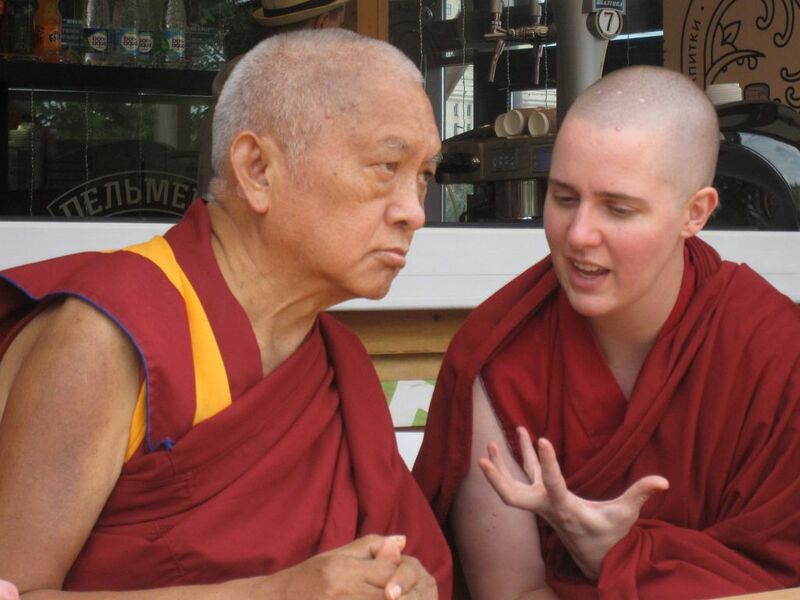 Lama Zopa Rinpoche and Ven. Lozang Yönten, Russia, 2015. Photo by Ven. Tenzin Chodron. The Buddha’s life was driven by a cause—to facilitate awakening in others. There was a moment of truth before he gave his first teaching where it wasn’t certain that he would make the attempt. The enormity and scale of suffering and ignorance in sentient beings daunted him. Yet, as the story goes, he came to understand that it wasn’t a lost cause. As the next forty years of his life unfolded, every moment was in service of teaching how to unblock our fullest potential and develop it fully. Shakyamuni Buddha’s lifetime was marked by frequent travel to diverse communities, and our present day Dharma centers, scattered across the globe, are his legacy. Their existence and the consistency of their core teachings are a testament to the brilliance of Buddha’s community work. I’ve lived in community nearly all of my adult life. Being an introvert, it is a strange choice. However, for the sake of direct access to teachings, companionship of fellow practitioners, and ethical, fulfilling work, it’s a lifestyle I am married to. 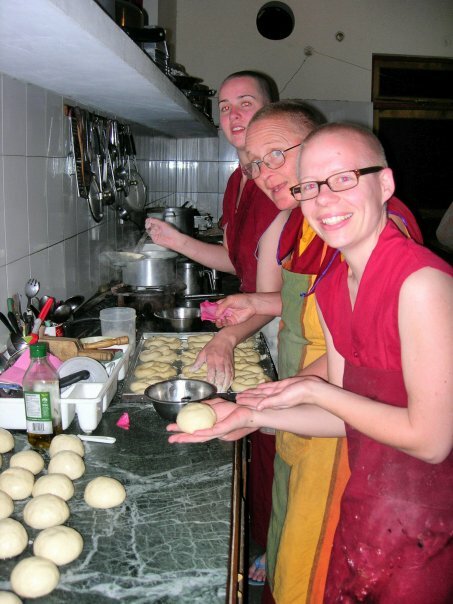 At Dharma centers I have played various roles: volunteering in the kitchen, coordinating cleaning teams and ritual setups as a gompa manager, being a student of the Basic Program, and now attempting to be a teacher (lowercase “t” emphasized) and to lead retreats. The communities I live in are full of kind, patient Dharma practitioners, earnest traveling seekers, and an occasional benign lost soul or two. I facilitate small gatherings of introspective, well intentioned people to continue and deepen their spiritual paths; competent, caring colleagues, and sincere volunteers support me. What could go wrong? Living in community, Thosamling, 2009. Photo courtesy of Ven. Lozang Yönten. I cringe thinking that afflictions arise in me even in such good conditions. It is embarrassing to admit. Yet I think those of you who have chosen a communal life would also admit that there is something intense that happens when you live with the same people you work, study, and practice with. For those of you who don’t live in community, you probably know the experience if you’ve done long group retreats. For the rest of you, imagine being in an arranged marriage with all of your coworkers. And even on your “days off,” you might need to jump back into your work mode—even if you are already in your pajamas. When you travel to other places, you probably still see the same people. No escape. The potential for friction exists. When I think of practitioner tales that uplift me during my everyday struggles, Shakyamuni Buddha stories do it for me. The reason is that the main conditions in my life for negativities to arise are related to my human relationships. And Buddha was as a genius at understanding human dynamics and community development. He had group work down pat before there was even the term “group work.” Of course omniscience helps! As a monastic, I also rely on the vinaya (monastic code) for advice and insight into the spectrum of human behavior. It reads like a series of profound, alarming, and hilarious anecdotes reflecting the lengths people go to build a cozy nest in samsara, while paying lip service to trying to break free. I see myself and my community in the foibles and failures of the historical disciples. The vinaya gives me strength to try to live more gently in my community. Ven. 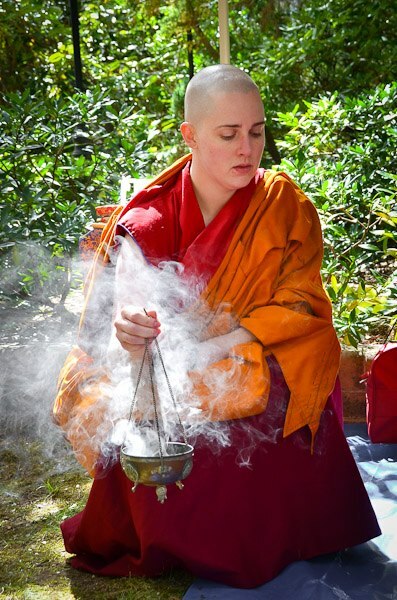 Lozang Yönten participating in a ceremony to dispel obstacles, Kunsang Yeshe Centre, Katoomba, New South Wales, Australia, 2013. Photo by Brigitte Grant. In it are revealed practical strategies to improve harmony and everyday happiness on our way to enlightenment. Having difficulty with someone? Here are ideas about effective communication. Having trouble controlling your five senses? Here are some handy ways to keep yourself under control while you build inner strength. Whenever his unruly community got up to some new mischief, Buddha gathered them together and explained compassionately, with logic, why that behavior doesn’t help the cause of awakening. Only then did he skillfully prescribe a new guideline. The vows were not pre-emptive; they arose in response to situations. To me this means I too don’t have to try to control every eventuality. I just need to keep working on opening my heart, focusing my mind, and relaxing into the moment. For lay people, stories of Buddha’s history are similarly useful for understanding how there really is nothing new in samsara. People have been bouncing between selfishness and altruism from time immemorial. I can’t recommend enough compilations like those found in Thich Nhat Hanh’s Old Path, White Clouds for inspiration. In them we see the practical and immediate use of the Dharma, directly applicable to our everyday lives with other humans. As a teacher, the Buddha guides me in the way he taught, not just the content. We are not all formally teachers but we do all have friends and family who rely on us at times for advice. We are sometimes at a loss about what to do or say when we see them struggle. Have you ever had the perfect solution on the tip of your tongue for your friend’s problem, and then rushed to share your insight, only to find that they weren’t interested or were even offended? I aspire to the way shown in the sutra story of Kisa Gotami and the mustard seed. A mother’s child died and she, grief-stricken, went to the Buddha. He didn’t say, “You aren’t the only person who has ever lost someone, try to see the big picture.” Not at all. He knew that logic would have no place to land in her mind and wouldn’t soothe her pain. Instead he told her to get a mustard seed from a household that had never experienced loss. Through her process of searching, unable to find a single one, she opened her heart and connected to her spiritual path. Buddha empowered her wisdom to arise and develop—he didn’t force-feed her something she wasn’t ready to hear. I think also about the Heart Sutra model: how much does the Buddha directly say? Not much. Rather, he empowers his senior students to engage in a conversation. At the end all he does is validate what was said, “Well said! Well said … !” To me this shows a way to build leadership within a group: wisdom and growth can be collaborative. When I want our communities to flourish, I can relax knowing a sound development model already exists: keep communicating with each other with ethics and kindness. When I see drama unfold, whatever the catalyst, I try to remember I don’t have to reinvent the wheel. Systems have already been built that work both internally and externally to reshape our chaotic tendencies into beauty. Ven. Lozang Yönten with the students of Mahamudra Centre, Colville, Coromandel, New Zealand, 2015. Photo by Sarah Brooks. Venerable Lozang Yönten is a registered FPMT In-Depth teacher and the IMI representative for Australia and New Zealand. She ordained as a Buddhist nun in 2003 and, with the permission of her teacher, received full (bhikshuni/ gelongma) ordination in 2011. 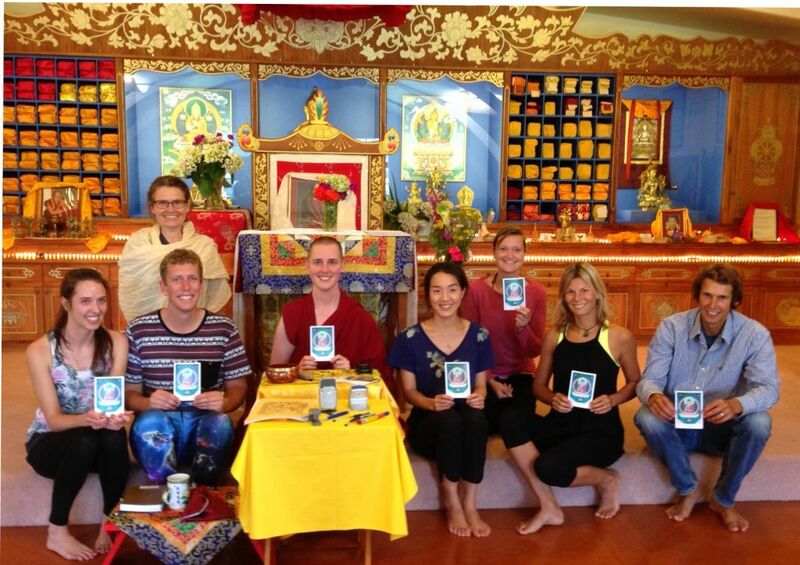 She is currently the teacher in residence at Mahamudra Centre for Universal Unity on New Zealand’s North Island and is on the Buddhist faculty of the Human Spirit Psychoanalytic-Buddhist Training Program in Lod, Israel, a joint project of the Israel Association for Self Psychology and the Study of Subjectivity and FPMT’s Istituto Lama Tzong Khapa.